Sunday, my one day home in Sydney from Sturt for the week. It is great to hang out and relax. I am in heaven. It is also the only time i access technology. So far throughout this year i seem to have been creating a stock of bisque ware, which is slowly filling the space where a new Clayworks shop will be opening in a few weeks. (mmmm....have to think about that ...in a few weeks!) This year is about discovering a new direction, breaking free from the old to re-stir up that passion which ebbs and flows throughout the creative process. 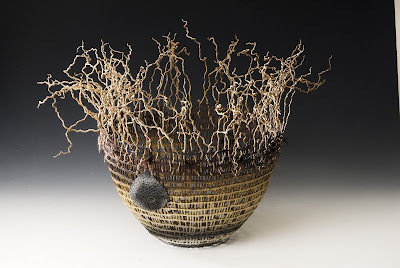 My previous work has always exhibited an earthy quality, achieved using minimal glaze expertise. Basket, 2009 is one example, where i applied oxides and utilised the saggar. I don’t mind to add a bit of tree product here and there also. I do love that natural aesthetic. Any time i try to do the porcelain thing, something seems missing. This week i fired a series of 70 glaze tests. This is highly unusual for me and i must admit the exercise could become quite addictive. I probably got a dozen or so good potential s, and, just on the quiet, one knockout! It creates inspiration in itself and i look forward to having a bigger play with it in the coming week.. I must also add that it is amazing what information pops up when you need it. Whilst firing the glaze tests i came across some answers i had been negotiating in a magazine i had randomly picked up in the studio as a wind down before a night class was about to begin. They really are an endless source of technical information, no matter how old they are. And as they say “when the student is ready, the teacher will appear”....or something like that. There is magic down here!